Corporate Clean Property Services uses a variety of cleaning strategies on any project and this can include high pressure water cleaning. High pressure cleaning describes a cleaning system that uses a pump to create a higher water pressure which, when applied to a surface, acts in a physical manner to clean the surface. With over 20 years’ experience in high pressure water cleaning for both the commercial and residential markets, Corporate Clean Property Services has the expertise and technical know-how to deliver the best pressure-cleaning finish possible. As a specialist cleaning company, we offer the most efficient and thorough cleaning solutions for any type of hard surface in your home or commercial building. We use the latest commercial-grade high-pressure cleaning equipment and, specialise in an environmentally friendly method of cleaning. 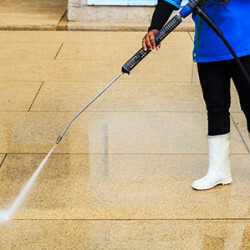 Our high pressure washing can restore any hard surface including building facades, concrete, brickwork, stone, tiles, footpaths, and paving to look as good as new. We can also clean your indoor surfaces by using specialised equipment that vacuums up the water as we clean. What is High Pressure Water Cleaning? High pressure cleaning describes a cleaning system that uses a pump to create a higher water pressure which, when applied to a surface, acts in a physical manner to clean the surface. To not damage surfaces and clean them properly using high pressure cleaners requires not only the right equipment but the right techniques and experience. Our experienced operators use a range of specialised high pressure and access equipment, unique biodegradable products, and they are fully trained in their use. So whether the surface to be cleaned is on the ground floor or the side of a high-rise building, they have the experience and knowledge to achieve a great result. They take great care in their work and produce a top quality clean that will restore your surfaces back to looking like new. Applying heated water rather than cold is more effective in dealing with more problematic stains as it helps dissolve them. We use a combination of low and high pressure techniques to remove ingrained dirt, stubborn stains, mould and more from a wide range of industrial, commercial and residential hard surfaces.